The game of chickenfoot, sometimes known as ‘chickie foot’, is a different variation of regular dominos where the overall aim is still the same. To win the game you must try to play all your tiles or have the lowest score at the end if you can’t. As in regular dominos, your score is counted at the end by how many dots you have left, so always try and get rid of those large tiles first. At the start of the game, each player has to pick five dominos from a centre pile that is face down on the table. The first player to win 7 games is deemed the champion. To start a game of Chickenfoot, the player who has drawn the double 6 must play it. If nobody has the double then the next highest double domino has to be played. All this sounds very familiar to ‘regular’ dominos, however the rules start to change slightly as play continues. The player who sits on the left of the original player, must play any domino they have with a 6 on it. Each player must continue in the round playing a 6 by adding it to all 4 sides of the original tile. If they don’t have a 6, then they must pick up a new domino from the centre and either play this or pass. No other play is allowed until all four sides of the initial double tile have been filled. Once this occurs, then normal game rules apply where you can play any matching domino to the exposed end of a played domino. The difference when playing Chickenfoot is that any time a player plays a double domino on the exposed domino with the same number as the double, the player has to call out ‘Chickie (number)’. This then means that from this point forward, there must be 3 more of this number played before the players can move on to another number. For example, someone may say ‘chickie 2’. This means that the next three dominos should all have a three in them and should be placed onto the double two that was placed down. This resembles a chickenfoot shape, hence the name of the game being chickenfoot. If any player doesn’t have a two to play, they must take a domino from the centre pile and play it if it has a two on it. If it doesn’t, sadly they must call pass and miss their turn. After there have been three dominoes placed with two’s on them, the next player can play any domino they like that matches an exposed end. This continues until there are no dominos left, or until there can be no more dominos placed. 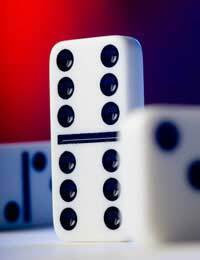 Dominos is much like poker at times, you can often gain an advantage by watching the reactions of others to the domino you’re playing. Since winning can often come down to who has the least points left on their dominos, it’s better to get rid of as many high dominos as you can. Many people will choose to hang onto their low value dominos and use up all the numbers, which they have the double for. This means that once you know there are no longer three free ends to complete the ‘chickie’, you can take control of the match and look very experienced and a little bit smug.